I had seen mentions of Jeff, Who Lives At Home around the web as part of lists of movies to see or movies of interest, but had otherwise not heard much about it. So on one of those days when I was alone at the Sietch, I figured I might as well kill some time by watching it and seeing what it was all about. I've written about how I enjoy occasionally going into a movie experience completely blind. There's something about the totally raw process of true discovery that happens when a story unfolds before your eyes for the very first time. And then the movie starts with, well, Jason Segel. I'm pretty sure that my partner, Tobie, has a thing for this guy, especially when he's trending more on the chunky side. And while he's a funny guy in general, there's the odd movie that doesn't quite rub me the right way. I guess it's because his brand of humor dances on the edge of what I can tolerate in terms of the more low brow sort of comedies that Hollywood likes churning out. And while this movie had small touches of that, the rest of it felt very indie in tone and storytelling style. And I don't mean that in a bad way. 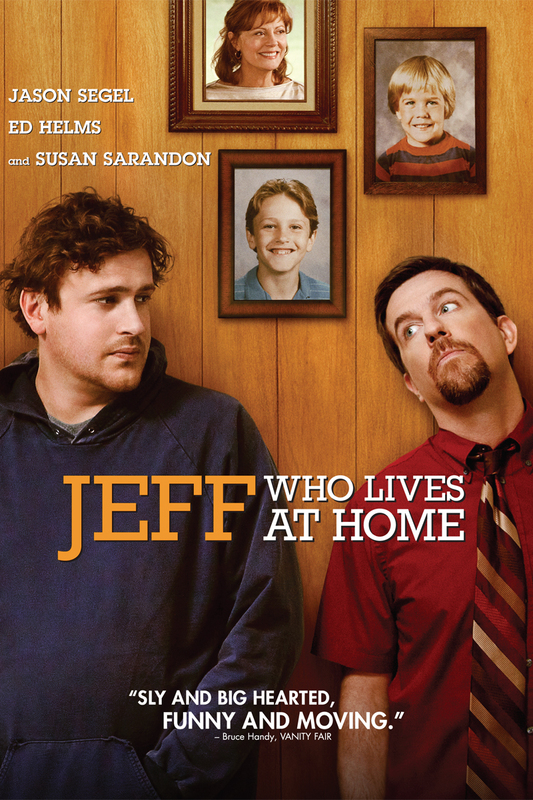 Synopsis: Jeff, Who Lives At Home is a 2011 comedy drama movie written and directed by Jay and Mark Duplass. It premiered at the 2011 Toronto International Film Festival. Jeff (Jason Segel) is a bit of a washout. He pretty much just gets high at home since he's unemployed and remains dependent on his mother (Susan Sarandon) for support. Jeff's older brother Pat (Ed Helms) is more successful career-wise, however his marriage is falling apart. Sharon, the mom, is naturally frustrated with Jeff's lack of direction in life but is also still busy with her own office job. But naturally one thing leads to another as things develop. Jeff is convinced that there are signs and symbols to be found in terms of life and a simple errand to buy wood glue leads to a weird journey around the city as he searches for a "Kevin." Pat buys a fancy new car since he thinks he deserves it, but this naturally infuriates his wife, Linda (Judy Greer). As she goes off, Pat suspects that she's having an affair with some third party. And Sharon starts to receive a series of messages at work from a secret admirer, if only she can figure out who this person may be. Initially the movie goes about the plot in a manner that is as unfocused and seemingly directionless as Jeff's life. And I'm sure this was rather intentional - we are following around a protagonist who thinks that the movie Signs holds special meaning for his life and he's out to find the signs in his own life. It almost seems like he has some sort of mental disability (no offense), but really it's just because he's a little slow with a fair amount of weed constantly in his system. Or at least that's the impression that I got. But there's a sense of hope and wonder in the way that Jeff goes through life - especially in stark contrast to Pat's increasing paranoia. It ultimately felt like Helms was pretty much just rehashing his character from The Office, which I admit he's good at but it didn't feel all that new either. So there were moments when it was funny and novel and other times it was just crazy and creepy. Susan Sarandon's storyline is a rather brilliant one that start out in a rather subtle manner and escalates quickly enough. Admittedly I loved the contrast that her scenes presented for the story since it still feel like her story was of a faster pace than Jeff's meandering path. Ironically, Jeff's story mostly took place outside of the home in contrast to what the title presented as a premise. And that's just an observation more than anything else. As far as comedies go, the movie had its funny moments. They range from ridiculous physical comedy to more thoughtful "oh I guess life's like that" sort of moments as well. I think it left me more thoughtful more than anything else and I wasn't immediately decided if I liked the movie at all. I think it's safe to say that I did, though. Jeff, Who Lives at Home is an interesting little story that is ultimately a family tale more than anything else. I don't foresee a heck of a lot of people liking the movie given the tone, but it's at least worth a viewing. Thus I'd rate it as a respectable 3.5 strange Jeff rationalizations out of a possible 5.